“I am fascinated by the form on the space. to understand their complexity and simplicity. in the purest of forms. A self-taught artist, A.V. Ilango made his debut in the art scene in 1973 on completing his Masters in Mathematics at the Bengaluru University. 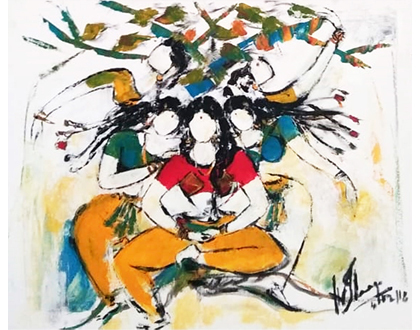 Inspired by his childhood memories spent in Gobichettipalayam, the artist vividly recalled the harvest, fairs and festivals that resounded with folk songs, music and dance, the drumbeat and tinkling of the ankle bells, Ochre musicians and dancers that enlivened the crowd with leaps and swirls in ecstasy. These were some of the images he captured on his earlier canvas. He was also inspired by the architectural and sculptural splendors of Madurai temples, folk dances like Karagam, Kavadi, and Oyilattam and later on Odissi in the Utsav series that was a pure celebration of dance. The artist opines that his way of conceptualizing, as a mathematician, has contributed a lot to his artistic research. 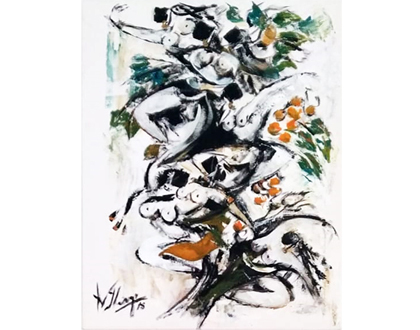 He values the linear quality in his oeuvre, and the development of a concept and the motif. Besides the human figure, the artist has been engaged in capturing in painting and sculpture the essence of the Bovine. According to him, cows and bulls form the very idiom of primitive, folk and classical arts of India. 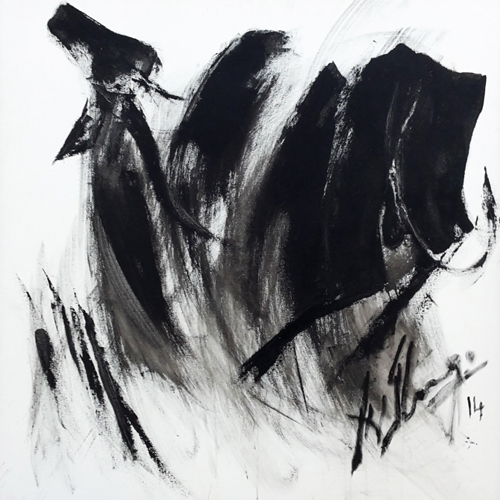 He continues to experiment with space, form and line and is heading towards capturing movements with abstract expressions. 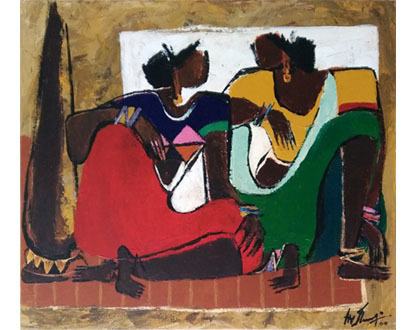 The artist lives and works in Chennai. 2011 - ‘Rhythm 2011’, Jamaat Gallery, Mumbai. 2010 - President Association of British scholars, Chennai Chapter.